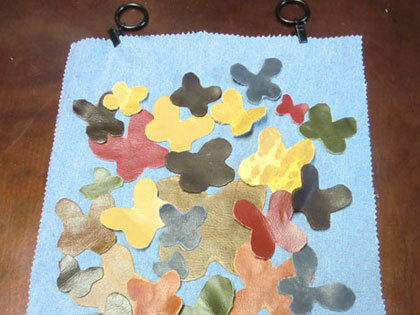 Make a Wall Hanging - DIY Projects - Step-by-Step Instructions Leather Scraps Wall Art - No Sew! 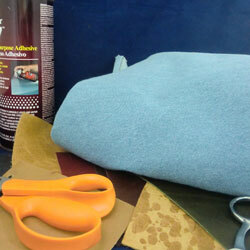 Need a project for leather fabric scraps? Create a cute wall hanging out of denim and leather scraps. Step 1. Cut out a rectangle or square for your background. 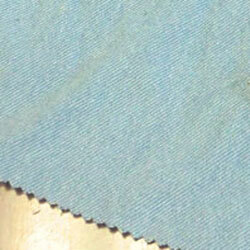 We used a light color denim and pinking shears. You could also use some iron on hemming tape or hem with a sewing machine. Step 2. 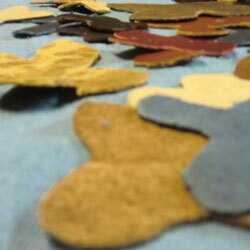 Cut out your shapes from your leather or fabric scraps. For 3-D effect, leather works better. We chose to do butterflies but flowers or abstract shapes would work as well. Step 3. 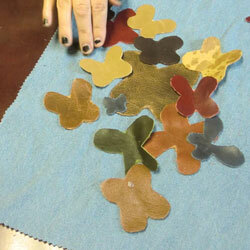 Use your spray adhesive or fabric glue to attach your cut-outs in a random pattern.